The Boston Bruins are reaping the benefits of being the top seed in the Eastern Conference. In the first round, the Bruins drew an injured and troubled Montreal Canadiens team, sweeping aside their traditional rivals. Now, because of re-seeding, the Bruins draw the sixth-seeded Carolina Hurricanes, the lowest-remaining seed in the East, in the second round. But the Bruins better be careful about what they wish for. Carolina is a dangerous team that has an air of magic about it after escaping the first round, despite trailing 3-2 in the series against New Jersey and 3-2 with 1:20 left in Game 7. Goalie Cam Ward is a Stanley Cup-winning goalie who showed his never-say-die attitude throughout the Devils series, outplaying Marty Brodeur across seven back-and-forth games. Still, the Bruins know they have the tools to handle Carolina. After all, Boston won all four games in the regular-season series and has its own pretty good goalie in Tim Thomas, a Vezina Trophy candidate. Plus, Boston can use monstrous Zdeno Chara in an attempt to neutralize top center Eric Staal. The Devils had no such player and Staal proved to the series-changer in the first round. The Bruins dressed 13 forwards in the first round and 12 of them found the score sheet in a four-game sweep of Montreal. That production attests to the depth at the disposal of Boston coach Claude Julien, who rolls his lines, usually without regard to matchup issues. Boston has three lines that can score on a regular basis, highlighted by the top line of Phil Kessel, Marc Savard and P.J. Axelsson. That unit accumulated 12 first-round points, with Savard and Kessel netting 11 of them. 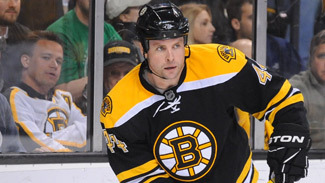 But they were outscored by the line of Michael Ryder, David Krejci and Milan Lucic, which put up a combined 15 points. Boston also has a defensive line that can counter any top line, featuring two-way center Patrice Bergeron, veteran Mark Recchi and wrecking ball Chuck Kobasew. Plus, the team has a ton of intimidating size in versatile players like Lucic, Shawn Thornton, Blake Wheeler and Byron Bitz. Carolina brings one of the more well-balanced attacks in the League. While most would guess Eric Staal led the Hurricanes in scoring during the regular season, it was actually Ray Whitney who led the way with 77 points. Staal, a tremendous offensive player, paced Carolina with 40 goals and lifted his team to a Game 7 victory against the Devils by breaking a 3-3 tie with 31.7 seconds left in regulation. The Hurricanes also boast plenty of other weapons like Chad LaRose (seven points against the Devils), Erik Cole and Tuomo Ruutu. Ryan Bayda, who was scratched in Game 1 of the opening round, ended up tallying a pair of goals against New Jersey. In the first round, Zdeno Chara showed that he is not only a worthy Norris Trophy candidate, but also that he is the type of player who can take over a playoff series. Montreal did everything possible to get Chara off his game -- including regularly deploying tough guy Georges Laraque against him -- but the big Slovak just kept his cool and made the plays. He played almost 25 minutes per game and never took a penalty, while finishing plus-2 with a game-winning goal to boot. Boston's depth isn't bad, either. Aaron Ward, Chara's partner, has three Stanley Cup rings and was integral in helping Boston keep its head in hostile Montreal. Dennis Wideman had four points in the first round. Matt Hunwick, his traditional partner, was knocked out in the series against Montreal, but Shane Hnidy stepped right into the breach. Hnidy, Steve Montador and Mark Stuart are all solid, dependable defensemen. Paul Maurice did some shuffling with his defensemen in the opening round. Dennis Seidenberg, who led the team in blocked shots during the regular season, was a healthy scratch for Games 2 and 3, but played the remaining four games of the series. Joe Corvo provides an offensive threat from the point and Tim Gleason's first postseason goal was the OT winner in Game 4. Anton Babchuk has a cannon of a slap shot, although we didn't see it much against the Devils. Babchuk's lack of production caused him to be a healthy scratch in Game 5, but he was reinserted into the lineup for the 4-0 win in Game 6. Joni Pitkanen has been a horse on Carolina's blue line, as the 6-foot-3 Finn has seen at least 24 minutes of ice time in every game this postseason and has four assists. Tim Thomas did just enough to make sure the Bruins won the series. He was never spectacular against Montreal, but he was rarely asked to be. Thomas finished with a 1.50 goals-against average and .958 save percentage. More importantly, he showed an emotional control that was lacking at times during last season's first-round series. The Bruins are fully confidence in Thomas. The majority of the publicity may have gone to Martin Brodeur in the opening round, but Cam Ward was arguably just as sharp. The 2006 Conn Smythe Trophy winner was the backbone of a 4-0 shutout in Game 6 and was almost as good as Brodeur in Game 5, if not for David Clarkson's power-play goal in the second period. Ward went 39-23-5 during the regular season with a 2.44 goals-against average and six shutouts. He kept the 'Canes in Game 7 against the Devils by stopping all 12 shots he faced in the third period. Claude Julien has the Bruins believing in his system and they are responding now without thought. Nothing could distract this team in the first round -- not the injury to Hunwick, not the suspension to Lucic, not the hostile reception in Montreal. The Bruins are playing disciplined hockey and not looking any further than the next game. With their talent, that is a recipe for success. Paul Maurice returned to Carolina as the most successful coach in Hartford/Carolina history, having amassed 268 wins in his 674 regular-season games coached during his first eight-plus seasons with the team, from Nov. 6, 1995, until Dec. 15, 2003. Maurice replaced the fired Peter Laviolette on Dec. 3, 2008 and helped Carolina avoid a third straight year of missing the playoffs. Under Maurice's guidance, the Hurricanes won nine straight games late in the regular season. "I think it's a good opportunity to get the rest mentally and get away from the game. I will honestly tell you that this was a pretty stressful series in terms of dealing with the media and dealing with the whole environment. Guys now get the opportunity to reflect on what just went on. A week before the next game is an opportunity for young guys to look at it and realize it's really not that much of a pressure-packed situation if you realize that you're a group. You're a team. You depend on each other and you're going to be successful." -- Boston defenseman Aaron Ward. "I'll remember that one when it's all said and done. That's one you keep in the memory bank. Now it only gets better from here. We'll go on to the second round and continue our season and play the Boston Bruins. We look forward to the challenge against them." -- Eric Staal, discussing his winning goal in Game 7 against the Devils. Boston's discipline showed most on the penalty kill. In the four-game series, the Bruins were only short eight times. For comparison, Detroit, which also won in a four-game sweep, was next on the list for fewest times shorthanded, at 13. More importantly, Boston did not allow a goal on any of those eight opportunities. On the power play, Boston scored on 4 of 16 opportunities and was dominant early in the series to set the tone for the sweep. It's somewhat remarkable that Carolina was unable to oust New Jersey in the opening round when you consider just how dreadful the power play was. The Hurricanes went 0-for-4 with the man advantage in Game 7 and finished the series just 2-for-29. Anton Babchuk will need to a better job of getting his tremendous slap shot on net against the defensively sound Bruins. The penalty killing, though, was a different story. Carolina certainly benefitted from the three-game absence of New Jersey captain Jamie Langenbrunner, but the Hurricanes' PK was still highly effective, allowing only three tallies in 26 situations. Milan Lucic, Bruins -- Lucic has that scary combination of skill and size. When he uses it correctly, he makes his line almost impossible to stop because he opens up the ice for his linemates -- Krejci and Ryder. Those two players are clicking incredibly at the moment, so if they are given time and space by Lucic, it could be a long series for the opposition's goalie. But if he uses that combination improperly -- see his suspension last round -- it submarines the team's disciplined approach. Bruins will win if ... If they play like they did in the first round. Boston played a virtually perfect series against Montreal, playing to its strengths and hiding its weaknesses. Boston's ability to stay disciplined negated Montreal's plan to play special-teams hockey and win games on the power play. At 5-on-5, the Canadiens were no match for Boston. Plus, Boston's lines are so balanced that they don't have to worry about getting out of synch by matching lines. Hurricanes will win if ... Eric Staal can continue to produce on the top line alongside Ray Whitney and Chad LaRose. Paul Maurice did his best to find a combination that would bring out the best in Staal, and he may have landed it in Game 6 when he opted to put the aforementioned trio together. All three players can skate and have the hands to inflict damage.